This classic scone variation is reproduced with permission from Buderim Ginger, with thanks. Making scones is quite forgiving. Just a couple of rules. Treat dough gently, mix and knead briefly to prevent the gluten in flour developing which will toughen the scones. 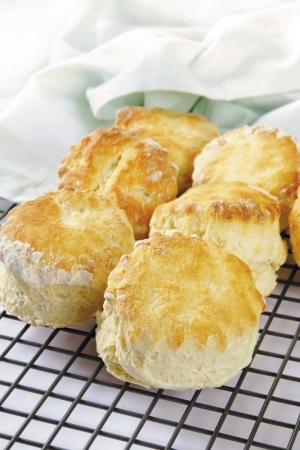 And using buttermilk produces tenderness and lighter scones .. wonderful in fact! 1. Preheat oven to very hot [220°C]. 3. Rub in butter to resemble breadcrumbs. 4. Combine buttermilk and Ginger Refresher, add all at once to flour. 5. With a knife gently mix until most of dry ingredients are moistened, adding a little extra buttermilk if it feels at all dry. Whilst in bowl using fingertips gently gather dough into a ball and gently knead with fingertips until dough is smooth. 6. Turn on to a lightly floured board. Pat or roll out to 2cm thickness. 7. Cut into rounds using a 6cm scone cutter, pushing cutter straight down into dough then pull it out without twisting for scones that will rise evenly. [You can re-roll scraps and cut additional scones, but they are never as tender as the first cut]. 8. Place on baking tray and glaze tops with milk. 9. Bake in preheated oven for 8 to 10 minutes or until tops are golden brown in colour. Ginger Marmalade Scones: Make-up 1 quantity above scone dough. Bake as directed for 6 to 8 minutes, remove from oven, brush tops with about 1/3 cup Buderim Ginger Original Ginger Marmalade or Buderim Ginger Ginger Lemon & Lime marmalade. Return to oven and continue baking for 2 minutes or until marmalade bubbles. Serve hot with Buderim Ginger Ginger Lemon & Lime Marmalade or Buderim Ginger Original Ginger Marmalade and whipped cream lightly sweetened with a couple of teaspoonsful of Ginger Refresher. A quick method - as it saves rubbing in butter, melt butter gently. Add to buttermilk and Ginger Refresher, then mix into flour.